Patrol the canals and bay of NINJAGO® City with Nya’s awesome Water Strider mech! Pretend to walk on water and climb walls with the posable legs and hover-style feet. Repel shark army attacks with the 6-stud rapid shooter. Use Kai’s 2 swords to swipe opponents off the mech. Puffer and Shark Army Thug don't stand a chance against the ninja and the Water Strider! Price is 10% below the initial Lego retail price, a € 4.00 discount! This comes down to 7.29 cent per brick. The Water Strider (70611) Lego set is available from the sites below. However, they do not offer delivery to your selected region. 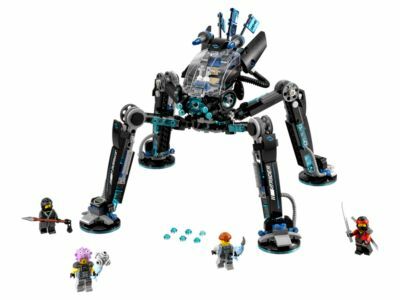 The Water Strider (70611) Lego set is no longer directly available from the sites below. However, 3rd party partners of these sites might still have the set available. Alternate description Smash the shark army out of the water with the Water Strider! Includes 4 minifigures: Nya, Kai, Puffer and Shark Army Thug. The Water Strider mech features a 360-degree rotating and opening minifigure cockpit, 6-stud rapid shooter, 4 posable legs with hover-pad-style feet, and 3 translucent-blue flags. Weapons include Nya's tasseled spear, Kai's 2 swords, Puffer's fish mace and Shark Army Thug's spiked fish dagger. Accessory elements include Nya's fabric skirt and Puffer's new-for-August-2017 helmet. Recreate and role-play exciting THE LEGO®NINJAGO® MOVIE™ scenes. Water Strider measures over 7” (18cm) high, 11” (30cm) long and 11” (30cm) wide.